Gaius Flavius Valerius Aurelius Constantinus (February 27, 272 C.E. – May 22, 337 C.E.) commonly known as Constantine I, Constantine the Great, or (among Eastern Orthodox and Eastern Catholic Christians) Saint Constantine, was a Roman emperor, proclaimed augustus by his troops on July 25, 306 C.E., and who ruled an ever-growing portion of the Roman Empire until his death. Constantine is best remembered in modern times for the Edict of Milan in 313, which fully legalized Christianity in the empire for the first time and the Council of Nicaea in 325 which he chaired; these actions completely changed the conditions under which Christians lived. Constantine brought to an end some 300 years of persecution, during which Christians had to worship in secret and faced arbitrary arrest and martyrdom in the coliseums. He inaugurated a new era, in which Christians enjoyed the power and patronage of the Roman state. Constantine's reputation as the "first Christian emperor" has been promulgated by historians from Lactantius and Eusebius of Caesarea to the present day; although there has been debate over the sincerity of his faith since he was baptized only on his death bed. It has been argued that he conflated the Sun God with the Christian God. His support for Christianity, however, was sincere and reflected in his policies. The church could now own land, Christians could worship openly, and imperial patronage resulted in the affirmation of a single creed. However, now that bishops had imperial support, those who dissented from the dominant concept of orthodoxy or othopraxis could be punished. Thus, Christianity was changed from a fairly loose and diverse body of believers into a orthodoxy based on a uniform faith with a disciplined hierarchical institution on the Roman pattern. Christians, previously reluctant to engage in military action, now joined the army and reconciled violence with their faith. Once Christianity became established as the state religion in the years following Constantine, the state began to impose Christianity on everyone and to persecute dissent, just as it had once persecuted Christians before Constantine's conversion. Christian leaders quickly took advantage of their power to punish heretics, pagans, and Jews, now backed by the coercive power of the state. 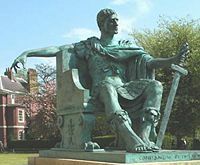 Bronze statue of Constantine I in York, England, near the spot where he was proclaimed emperor in 306 C.E. Constantine, named Flavius Valerius Constantinus, was born in the military city of Naissus Serbia) on the February 27, of an uncertain year. His father was Flavius Constantius, a native of Moesia Superior. Constantius was a tolerant and politically skilled man. Constantine probably spent little time with his father who was an officer in the Roman army in 272, part of the Emperor Aurelian's imperial bodyguard. Constantius advanced through the ranks, earning the governorship of Dalmatia from Emperor Diocletian in 284 or 285. Constantine's mother was Helena, a Bithynian Greek of humble origin. It is uncertain whether she was legally married to Constantius or merely his concubine. His father left his mother around 292 C.E. to marry Flavia Maximiana Theodora, daughter or step-daughter of the Western Roman Emperor Maximian. Theodora would give birth to six half-siblings of Constantine, including Julius Constantius. Young Constantine served at the court of Diocletian in Nicomedia, after the appointment of his father as one of the two caesares (junior emperors) of the Tetrarchy in 293 C.E., where he received a formidable education studying Latin literature, Greek, and philosophy. The cultural environment in Nicomedia was open, fluid and socially mobile, and Constantine could mix with intellectuals both pagan and Christian. He may have attended the lectures of Lactantius, a Christian scholar of Latin in the city. When both augusti (senior emperors), Diocletian and Maximian, abdicated Constantius succeeded to Maximian's position of western augustus. Although two legitimate sons of emperors were available (Constantine and Maxentius, the son of Maximian), both of them were overlooked in this transition of power. Instead, Flavius Valerius Severus and Maximinus Daia were made caesares. Constantine subsequently left Nicomedia to join his father in Roman Gaul. However, Constantius fell sick during an expedition against the Picts of Caledonia (Scotland), and died on July 25, 306 C.E., in Eboracum (York). The general Chrocus, of Alamannic descent, and the troops loyal to Constantius' memory immediately proclaimed Constantine an augustus. Under the Tetrarchy, Constantine's succession was of dubious legitimacy. While Constantius as senior emperor could "create" a new caesar, Constantine's (or, rather, his troops') claim to the title of augustus ignored the system of succession which had been established in 305 C.E. Accordingly, Constantine asked Galerius, the eastern augustus, to be recognized as heir to his father's throne. Galerius granted him the title of caesar, confirming Constantine's rule over his father's territories, and promoted Severus to augustus of the West. Public baths (thermae) built in Trier by Constantine. More than 100 meters (328 ft) wide by 200 meters (656 ft) long, and capable of serving several thousands at a time, the baths were built to rival those of Rome. Constantine's share of the empire comprised of Roman Britain, Roman Gaul, the Germanic provinces, and Hispania (Spain). He therefore commanded one of the largest Roman armies stationed along the important Rhine frontier. While Gaul was one of the richer regions of the empire, it had suffered much during the Crisis of the Third Century. Many areas were depopulated, the cities left ruined. During his years in Gaul, from 306 C.E. to 316 C.E., Constantine continued his father's efforts to secure the Rhine frontier and rebuild the Gallic provinces. His main residence during that time was in Trier. Immediately after his promotion to emperor, Constantine abandoned his father's British campaign and returned to Gaul to quell an uprising by Franks. Another expedition against Frankish tribes followed in 308 C.E. After this victory, he began to build a bridge across the Rhine at Cologne to establish a permanent stronghold on the right bank of the river. A new campaign in 310 had to be abandoned because of Maximian's rebellion (see below). The last of Constantine's wars on the Rhine frontier took place in 313 C.E., after his return from Italy, and saw him again victorious. Constantine's main goal was stability, and he tried to achieve that by immediate, often brutal punitive expeditions against rebellious tribes, demonstrating his military power by conquering the enemies on their own side of the Rhine frontier, and slaughtering many prisoners during games in the arena. This strategy proved successful, and the Rhine frontier remained relatively quiet during the rest of Constantine's reign. With respect to the interior conflicts of the Tetrarchy, Constantine tried to remain neutral. In 307 C.E., the senior emperor Maximian (recently returned to the political scene after his abdication in 305 C.E.) visited Constantine to get his support in the war of Maxentius against Flavius Valerius Severus and Galerius. Constantine married Maximian's daughter Fausta to seal the alliance and was promoted to Augustus by Maximian. He did not, however, interfere on Maxentius' behalf. Maximian returned to Gaul in 308 C.E. after he had failed to depose his son. At the conference of Carnuntum, where Diocletian, Galerius and Maximian met later that year, Maximian was forced to abdicate again and Constantine was reduced to caesar. In 309 C.E., Maximian rebelled against his son-in-law while Constantine was campaigning against the Franks. The rebellion was quickly quelled, and Maximian was killed or forced to commit suicide. In the summer of 311, Maximian's son Maxentius proclaimed his desire to avenge his father's death. He mobilized against Constantine while Licinius was occupied with affairs in the East. To prevent Maxentius from forming an alliance against him with Licinius, Constantine forged his own alliance with Licinius over the winter of 311–12, and offered him his sister Constantia in marriage. Constantine made quick progress defeating a large force of heavily armed Maxentian cavalry. Verona surrendered soon afterwards, followed by Aquileia, Mutina (Modena), and Ravenna. The road to Rome was now wide open to Constantine. [Maxentius organized his forces—still twice the size of Constantine's—in long lines facing the battle plain, with their backs to the river. 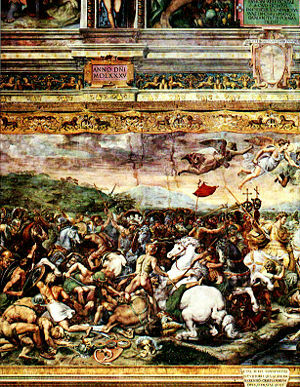 The Battle of the Milvian Bridge by Giulio Romano. Christian sources record that Constantine experienced a dramatic event in 312 at the Battle of Milvian Bridge, after which Constantine would claim the emperorship in the West. According to these sources, Constantine looked up to the sun before the battle and saw a cross of light above it, and with it the Greek words "Εν Τουτω Νικα" ("by this, conquer!" often rendered in the Latin "in hoc signo vinces"); Constantine commanded his troops to adorn their shields with a Christian symbol (the Chi-Ro). Constantine deployed his own forces along the whole length of Maxentius' line. He ordered his cavalry to charge, and they broke Maxentius' cavalry. He then sent his infantry against Maxentius' infantry, pushing many into the Tiber where they were slaughtered and drowned. The battle was brief and Maxentius' troops were broken before the first charge. Maxentius' horse guards and praetorians initially held their position, but broke under the force of a Constantinian cavalry charge; they also broke ranks and fled to the river. Maxentius rode with them, and attempted to cross the bridge of boats, but he was pushed by the mass of his fleeing soldiers into the Tiber, and drowned. Following the battle, Constantine ignored the altars to the gods prepared on the Capitoline to receive sacrifices appropriate for the celebration of his victorious entry into Rome, and the new emperor instead went straight to the imperial palace without performing any sacrifice. He did, however, choose to honor the Senatorial Curia with a visit, where he promised to restore its ancestral privileges and give it a secure role in his reformed government: There would be no revenge against Maxentius' supporters. In response, the Senate decreed him "title of the first name," which meant his name would be listed first in all official documents, and acclaimed him as "the greatest Augustus." He issued decrees returning property lost under Maxentius, recalling political exiles, and releasing Maxentius' imprisoned opponents. How much Christianity Constantine adopted at this point, however, is difficult to discern; most influential people in the empire, especially high military officials, were still pagan, and Constantine's rule exhibited at least a willingness to appease these factions. The Roman coins minted up to eight years after the battle still bore the images of Roman gods. Neither did the monuments he first commissioned, such as the Arch of Constantine, contain a reference to Christianity. In an extensive propaganda campaign followed, Maxentius' image was systematically purged from all public places. Maxentius was written up as a "tyrant," and set against an idealized image of the "liberator," Constantine. Eusebius, in his later works, is the best representative of this strand of Constantinian propaganda. 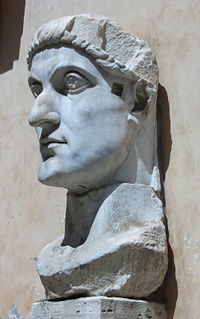 Constantine also attempted to remove Maxentius' influence on Rome's urban landscape. All structures built by Maxentius were re-dedicated to Constantine. His victory over Maxentius resulted in Constantine's becoming Western Augustus, or ruler of the entire Western Roman Empire. He gradually consolidated his military superiority over his rivals in the crumbling Tetrarchy. In 313, Constantine met Licinius in Milan to secure their alliance by the marriage of Licinius and Constantine's half-sister Constantia. During this meeting, the emperors agreed on the so-called Edict of Milan (which, in its surviving forms, was neither an edict nor issued in Milan), officially granting full tolerance to all religions in the Empire. The document had special benefits for Christians, legalizing their religion and granting them restoration for all property seized during Diocletian's persecution. It repudiates past methods of religious coercion, accepting religious plurality and using only general terms—"Divinity" and "Supreme Divinity," summa divinitas—avoiding any exclusive specificity. It also "declared unequivocally that the co-authors of the regulations wanted no action taken against the non-Christian cults." Christianity had previously been decriminalized in April 311 by Galerius, who was the first emperor to issue an edict of toleration for all religious creeds, including Christianity but the Edict of Milan removed all obstacles to the Christian faith. The conference was cut short, however, when news reached Licinius that his rival Maximinus Daia had crossed the Bosporus and invaded Licinian territory. Licinius departed and eventually defeated Maximinus, gaining control over the entire eastern half of the Roman Empire. Relations between the two remaining emperors deteriorated, though, and either in 314 or 316, Constantine and Licinius fought against one another in the war of Cibalae, with Constantine being victorious. In the year 320 C.E., Licinius, emperor of the Eastern Roman Empire, reneged on the religious freedom promised by the Edict of Milan in 313 C.E. and began another persecution of Christians. This was a puzzling inconsistency since Constantia, half-sister of Constantine and wife of Licinius, was an influential Christian. It became a challenge to Constantine in the west, climaxing in the great civil war of 324 C.E. The armies were so large that numbers such as theirs would not be seen again until at least the fourteenth century. Licinius, aided by Goth mercenaries, represented the past and the ancient faith of Paganism. Constantine and his Franks marched under the Christian standard of the labarum, and both sides saw the battle in religious terms. Supposedly outnumbered, but inspired by zeal, Constantine's army emerged victorious. With the defeat and death of Licinius (Constantine was known for being ruthless with his political enemies: Constantine had publicly promised to spare his life, but a year later he accused him of plotting against him and had him executed by strangulation), Constantine then became the sole emperor of the entire Roman Empire. Licinius' defeat represented the passing of old Rome, and the beginning of the role of the Eastern Roman Empire as a center of learning, prosperity, and cultural preservation. Constantine rebuilt the city of Byzantium, and renamed it Nova Roma (New Rome), providing it with a Senate and civic offices similar to those of Rome. The new city was protected by an alleged relic of the True Cross, the Rod of Moses and other holy relics. A cameo now at the Hermitage Museum also represented Constantine crowned by the tyche of the new city. The figures of old gods were replaced and often assimilated into Christian symbolism. On the site of a temple dedicated to the goddess Aphrodite, the new Basilica of the Apostles was built. Generations later there was a story that a divine vision led Constantine to this spot, and an angel visible only to him led him on a circuit of the new walls. After his death, his capital was renamed Constantinopolis (in English Constantinople, "Constantine's City"). Constantinople was a new, Christian city for the new, Christian empire. It was to be nobler than Rome because although glorious, Rome's foundation were pagan. In 326 C.E., Constantine had his eldest son Crispus tried and executed, as he believed accusations that Crispus had an affair with Fausta, Constantine's second wife. A few months later he also had Fausta killed as she was deemed to be the apparent source of these false accusations. Constantine followed one custom of the time, which postponed baptism until old age or death. Constantine was not baptized until close to his death in 337, when his choice fell upon the Arian bishop Eusebius of Nicomedia, who happened, despite his being an ally of Arius, to still be the bishop of the region. Constantine was succeeded by three sons by Fausta, Constantine II, Constantius II, and Constans. A number of other relatives were murdered by followers of Constantius. He also had two daughters, Constantina and Helena, wife of Julian the Apostate. Constantine is best known for being the first Roman emperor to embrace Christianity, although he may have continued in his pre-Christian beliefs as well. He was exposed to Christianity by his mother, Helena. There is scholarly controversy, however, as to whether Constantine adopted his mother's Christianity in his youth, or whether he adopted it gradually over the course of his life. Constantine was over 40 when he finally declared himself a Christian. Writing to Christians, Constantine made clear that he owed his successes to the protection of that High God alone. There has been much speculation as to whether his conversion was genuine or strategic. He certainly hoped the church would be a politically integrating force. And as Christians grew more numerous, it made sense to gain their support. There is some controversy as to the vision Constantine saw at the Battle of the Milvian Bridge. Lactantius states that, in the night before the battle, Constantine was commanded in a dream to "delineate the heavenly sign on the shields of his soldiers." He obeyed and marked the shields with a sign "denoting Christ." Lactantius describes that sign as a "staurogram," or a Latin cross with its upper end rounded in a P-like fashion. There is no certain evidence that Constantine ever used that sign, as opposed to the better known chi-rho sign described by Eusebius. From Eusebius, two accounts of the battle survive. The first, shorter one in the Ecclesiastical History leaves no doubt that God helped Constantine but doesn't mention any vision. In his later Life of Constantine, Eusebius gives a detailed account of a vision and stresses that he had heard the story from the emperor himself. According to this version, Constantine with his army was marching somewhere when he looked up to the sun and saw a cross of light above it, and with it the Greek words "Εν Τούτῳ Νίκα." The Latin translation is in hoc signo vinces—"In this (sign), conquer." At first he was unsure of the meaning of the apparition, but in the following night he had a dream in which Christ explained to him that he should use the sign against his enemies. Eusebius then continues to describe the labarum, the military standard used by Constantine in his later wars against Licinius, showing the chi-rho sign. Those two accounts have been merged into the popular notion of Constantine seeing the Chi-Rho sign at the evening before battle. Both authors agree that the sign wasn't readily understandable to denote Christ, which corresponds to the fact that there is no certain evidence of the use of chi-rho as a Christian sign before Constantine. Its first appearance is on a Constantinian silver coin from c. 315, which proves that Constantine did use the sign at that time, though not very prominently. He made extensive use of the Chi-Rho and the Labarum only later in the conflict with Licinius. 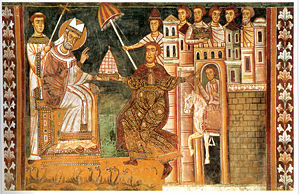 The accession of Constantine was a turning point for the Christian Church, generally considered the beginning of Christendom. After his victory, Constantine took over the role of the patron for the Christian faith. Constantine made Sunday a holiday and day of rest throughout the empire. He built three huge churches, St. Peter's in Rome, Hagia Sophia in Constantinople and the Holy Sepulchre in Jerusalem. Throughout his rule, Constantine supported the Church financially, built various basilicas, granted privileges (for example, exemption from certain taxes) to clergy, promoted Christians to high ranking offices, and returned property confiscated during the Great Persecution of Diocletian and spent enormous amounts of money from the state treasury to pay clergy. In doing this, however, Constantine required the Pagans "to foot the bill". Christian chroniclers tell that it appeared necessary to Constantine "to teach his subjects to give up their rites (…) and to accustom them to despise their temples and the images contained therein." This led to the closure of pagan temples due to a lack of support, their wealth flowing to the imperial treasure. Constantine did not need to use force to implement this although his subjects are said to simply have obeyed him out of fear. The reign of Constantine established a precedent for the position of the Christian Emperor in the Church; Constantine considered himself responsible to God for the spiritual health of his subjects, and thus he had a duty to maintain orthodoxy. Indeed, he called himself "a bishop, ordained by God to oversee whatever is external to the church." The emperor ensured that God was properly worshiped in his empire; what proper worship consisted of was for the Church to determine. In 316, Constantine acted as a judge in a North African dispute concerning the heresy of the Donatists. He ruled that Cæcilianus, not Donatus, was the rightful Bishop of Carthage. In 317 Constantine ordered the confiscation of Donatist churches in Carthage and the death penalty on those who disturbed the peace. Constantine's actions resulted in banishments and even executions when violence erupted. It also failed completely, as the Donatists grew all the more fierce in their convictions. By 321 Constantine changed his approach and granted toleration to the Donatists, asking the catholic bishops to show them moderation and patience. The Council of Nicaea was historically significant because it was the first effort to attain consensus in the church through an assembly representing all of Christendom. Constantine invited and offered to sponsor all 1800 bishops. In fact around 300 attended nearly all of whom were from the east. "Resplendent in purple and gold, Constantine made a ceremonial entrance at the opening of the council, probably in early June, but respectfully seated the bishops ahead of himself." As Eusebius described, Constantine "himself proceeded through the midst of the assembly, like some heavenly messenger of God, clothed in raiment which glittered as it were with rays of light, reflecting the glowing radiance of a purple robe, and adorned with the brilliant splendor of gold and precious stones." He was present as an observer and he did not vote. Constantine organized the Council along the lines of the Roman Senate with Hosius presiding over its deliberations. The council came out against Arianism and five dissenters were banished and Constantine threatened with death anyone who did not deliver Arius' books up to be burned. Constantine later discovered that most Christians in Asia Minor were Arians and called another council to try to achieve consensus. In all this he, and later emperors, were motivated by a desire for uniformity that would be promote social peace and imperial cohesion. By convoking and presiding over the council, Constantine signaled a measure of imperial control over the church. Although Constantine was not baptized and held no position within the church, the church did not resist being co-opted for imperial purposes. On the contrary, many Christians saw his elevation to the emperorship as part of God's providence. Up until this time the church had not had to articulate its beliefs in a binding creed which would determine who was a Christian and who was not. The council also promulgated a number of enforceable canons to regulate church governance thus creating a disciplined institution. From this time on the relationship between church and state became very complicated with the church co-opting the state to enforce its beliefs and persecute those it deemed heretics. Constantine also enforced the prohibition of the First Council of Nicaea against celebrating Easter on the day before the Jewish Passover. Some commentators have concluded that the desire for an independent Christian calendar was motivated by bitterness towards Judaism. A circular letter of Emperor Constantine issued during the Council with strong anti-Jewish language lends weight to the charge of anti-Judaism, stating that that: "…It appeared an unworthy thing that in the celebration of this most holy festival we should follow the practice of the Jews, who have impiously defiled their hands with enormous sin, and are, therefore, deservedly afflicted with blindness of soul. …Let us then have nothing in common with the detestable Jewish crowd; for we have received from our Saviour a different way." Constantine instituted several legislative measures which had an impact on Jews. They were forbidden to own Christian slaves or to circumcise their slaves. Conversion of Christians to Judaism was outlawed. Congregations for religious services were restricted, but Jews were allowed to enter Jerusalem on Tisha B'Av, the anniversary of the destruction of the Temple. From the time of Constantine more and more anti-Jewish legislation was passed as Christianity grew in prestige and power. Coins struck for emperors often reveal details of their personal iconography. During the early part of Constantine's rule, representations first of Mars and then (from 310 C.E.) of Apollo as sun god consistently appeared on the reverse sides of the coinage. Mars had been associated with the Tetrarchy, and Constantine's appropriation of this symbolism served to emphasize the legitimacy of his rule. After his breach with his father's old colleague Maximian in 309 C.E.–310 C.E., Constantine began to claim legitimate descent from the third century emperor Marcus Aurelius Claudius Gothicus, the hero of the Battle of Naissus (September 268). The Augustan History of the fourth century reports Constantine's paternal grandmother Claudia to be a daughter of Crispus, who himself was reportedly the brother of both Claudius II and Quintillus. Modern historians, however, suspect this account to be a genealogical fabrication intended to flatter Constantine. Gothicus had claimed the divine protection of Apollo-Sol Invictus. In mid-310 C.E., two years before the victory at Milvian Bridge, Constantine reportedly experienced the publicly announced vision in which Apollo-Sol Invictus appeared to him with omens of success. Thereafter the reverses of his coinage were dominated for several years by his "companion, the unconquered Sol"—the inscriptions read SOLI INVICTO COMITI. The depiction represents Apollo with a solar halo, Helios-like, and the globe in his hands. In the 320s Constantine received a halo of his own in images. There are also coins depicting Apollo driving the chariot of the Sun on a shield which Constantine is holding and in one example, from 312, shows the Christian symbol of the chi-rho on a helmet worn by Constantine. The great staring eyes in the iconography of Constantine, though not specifically Christian, show how official images were moving away from early imperial conventions of realistic portrayals towards schematic representations. 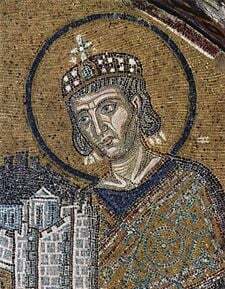 Namely, they projected a stylized image of the emperor as emperor, not merely as the particular individual Constantine, with his characteristic broad jaw and cleft chin. The large staring eyes loomed larger as the fourth century progressed: compare the early fifth century silver coinage of Theodosius I.
Constantine passed numerous laws, encompassing such mundane matters as making the occupations of butcher and baker hereditary. More crucially, supported converting the coloni (tenant farmers) into serfs—laying the foundation for European society during the Middle Ages. For the first time, young females could not be abducted (this may actually refer to elopements, which were considered kidnapping because girls could not legally consent to the elopement). A prisoner was no longer to be kept in total darkness, but must be given access to the outdoors and daylight. A condemned man was allowed to die in the arena, but he could not be branded on his "heavenly beautified" face, just on his feet (because God made man in his image). Slave "nurses" or chaperons caught allowing the girls they were responsible for to be seduced were to have molten lead poured down their throats. Gladiatorial games were ordered to be eliminated in 325 C.E., although this had little real effect. Crucifixion was abolished for reasons of Christian piety, but was replaced with hanging, to show that there was still Roman law and justice. Sunday was declared a day of rest, on which market activity was banned and public offices were closed (except for the purpose of freeing slaves). However, there were no restrictions on farming work (which was the work of the great majority of the population). Although he earned his honorific of "The Great" from Christian historians long after he had died, Constantine could have claimed the title on his military achievements and victories alone. In addition to reuniting the empire under one emperor, Constantine won major victories over the Franks and Alamanni (306 C.E.–308 C.E. ), the Franks again (313–314), the Visigoths in 332 C.E. and the Sarmatians in 334 C.E. In fact, by 336 C.E., Constantine had actually reoccupied most of the long-lost province of Dacia, which Aurelian had been forced to abandon in 271 C.E. At the time of his death, he was planning a great expedition to put an end to raids on the eastern provinces from the Persian Empire. The Byzantine Empire considered Constantine its founder and the Holy Roman Empire reckoned him among the venerable figures of its tradition. In both East and West, emperors were sometimes hailed as "new Constantines." Most Eastern Christian churches, both Catholic and Orthodox, consider Constantine a saint. In the East he is sometimes called "Equal-to-apostles" (isapostolos) or the "thirteenth apostle." 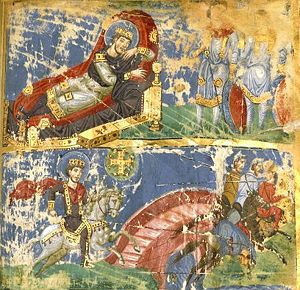 A thirteen century fresco of Sylvester and Constantine, showing the purported Donation. Santi Quattro Coronati, Rome. In later years, historical facts became clouded by legend. It was considered inappropriate that Constantine was baptized only on his death-bed and by a bishop of questionable orthodoxy, and hence a legend emerged that Pope Silvester I (314-335 C.E.) had cured the pagan emperor from leprosy. According to this legend, Constantine was baptized after that and donated buildings to the pope. In the eighth century, a document called the "Donation of Constantine" first appeared, in which the freshly converted Constantine hands the temporal rule over Rome, Italy and the Occident to the pope. In the High Middle Ages, this document was used and accepted as the basis for the pope's temporal power, though it was denounced as a forgery by Emperor Otto III, Holy Roman Emperor and lamented as the root of papal worldliness by the poet Dante Alighieri. The fifteenth century, philologist Lorenzo Valla proved the document was indeed a forgery. ↑ In (Latin Constantine's official imperial title was IMPERATOR CAESAR FLAVIVS CONSTANTINVS PIVS FELIX INVICTVS AVGVSTVS, “Imperator Caesar Flavius Constantine Augustus, the pious, the fortunate, the undefeated.” After 312 C.E., he added MAXIMVS ("the greatest"), and after 325 C.E. replaced INVICTUS ("undefeated") with VICTOR, as INVICTUS reminded of Sol Invictus, the sun god. ↑ The Eastern Catholic Churches of Byzantine rite consider Constantine a saint, while he is not included in the Roman Martyrology of the Latin Church. ↑ Charles Matson Odahl, Constantine and the Christian Empire (New York: Routledge, 2004, ISBN 0415174856), 72, 301. ↑ From about 235 until 284, the Roman Empire nearly collapsed. This crises was caused by the combination of external invasion by the Goths and by internal conflict over the succession which fragmented the Empire. ↑ R. Gerberding and J. H. Moran Cruz, Medieval Worlds (New York: Houghton Mifflin Company, 2004) 55. ↑ Peter Brown, The Rise of Christendom, (Blackwell Publishing, 2003), 60. ↑ Peter Brown, The Rise of Christendom, 2nd edition (Blackwell Publishing, 2003), 60. ↑ John Curran, Pagan City and Christian Capital. Rome in the Fourth Century (Oxford University Press, 2002), 70-90. ↑ Hermitage Rooms, The Road to Byzantium. Retrieved June 1, 2007. ↑ In this period infant baptism had not yet become a matter of routine in the west (although many infant baptisms were performed, it was initially only done in times of emergency, and it was seen more as a promise of future submission to Christianity than a deliberate choice to be Christian). Adults who voluntarily submitted to baptism made a clear statement of their beliefs, placing them safely among the redeemed. Some waited until old age or death for various reasons, creating tensions between churchmen who encouraged their congregations to submit and those who wavered. ↑ R. Gerberding and J. H. Moran Cruz, Medieval Worlds (New York: Houghton Mifflin Company, 2004), 55. ↑ Peter Brown, The Rise of Christendom, 2nd edition (Oxford, Blackwell Publishing, 2003), 60. ↑ Gerberding and Moran Cruz, 55. ↑ Constantine's St. Sophia burned down after about two hundred years and was replaced by the present structure during the reign of Emperor Justinian. ↑ R. Gerberding and J.H. Moran Cruz, Medieval Worlds (New York: Houghton Mifflin Company, 2004), 55-56. ↑ Ramsay MacMullen, Christianizing The Roman Empire A.D. 100-400 (Yale University Press, 1984). ↑ Ramsay MacMullen, Christianizing The Roman Empire A.D. 100-400 (Yale University Press, 1984), 49. ↑ Jeffrey Richards, The Popes and the Papacy in the Early Middle Ages 476-752 (London: Routledge & Kegan Paul, 1979), 16. ↑ Richard Kieckhefer, "Papacy." Dictionary of the Middle Ages (1989, ISBN 0684182750). ↑ Warren H. Carroll, The Building of Christendom (1987), 11. ↑ Eusebius, The Life of the Blessed Emperor Constantine, Book 3, Chapter 10. ↑ Catholic Encyclopedia, Life of Constantine. Retrirved October 20, 2008. ↑ Philip Schaff, History of the Christian Church, Volume III: Nicene and Post-Nicene. Retrieved October 21, 2008. ↑ Eusebius of Caesaria, Life of Constantine (Book III). Retrieved October 20, 2008. ↑ In2Greece, Greek Orthodox Saints: St. Constantine. Retrieved June 1, 2007. Baker, Al. 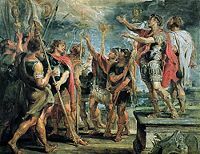 Is it true that Emperor Constantine led an army of Christians against the Donatists in 316 C.E.? Early Church History - CH101, January 17, 2012. Retrieved October 16, 2013. Brown, Peter. The Rise of Western Christendom. Wiley-Blackwell, 2003. ISBN 978-0631221388. Chapman, John. "Donatists." The Catholic Encyclopedia, 1909. Chuvin, Pierre. A Chronicle of the Last Pagans. Translated by B. A. Archer. Cambridge, MA: Harvard University Press, 1990. ISBN 0674129709. John Curran. Pagan City and Christian Capital: Rome in the Fourth Century. Oxford University Press, 2002. ISBN 978-0199254200. Dodds, Eric Robertson. The Greeks and the Irrational. Literary Licensing, LLC, 2013. ISBN 978-1258776893. Dodds, Eric Robertson. Pagan and Christian in an Age of Anxiety: Some Aspects of the Religious Experience from Marcus Aurelius to Constantine. New York, NY: Cambridge University Press, 1990. ISBN 0521385997. Gerberding, Richard, and Jo Ann Hoeppner Moran Cruz. Medieval Worlds. Cengage Learning, 2003. ISBN 978-0395560877. Herbermann, Charles G. and Georg Grupp. "Constantine the Great." The Catholic Encyclopedia, 1908. Jones, Arnold Hugh Martin. Constantine and the Conversion of Europe. University of Toronto Press, 1978. ISBN 978-0802063694. Kieckhefer, Richard, "Papacy." Dictionary of the Middle Ages, 1989. ISBN 0684182750. Lactantius. Of the Manner the in Which the Persecutors Died. London: T. Cadell, 1782. MacMullen, Ramsay. Constantine. London: Croom Helm, 1987. ISBN 0709946856. MacMullen, Ramsay. Christianizing the Roman Empire: (A.D. 100-400). New Haven, CT: Yale University Press, 1984. ISBN 0300032161. MacMullen, Ramsay. Changes in the Roman Empire: Essays in the Ordinary. Princeton, NJ: Princeton University Press, 1990. ISBN 0691036012. MacMullen, Ramsay. Enemies of the Roman Order: Treason, Unrest, and Alienation in the Empire. London: Routledge, 1992. ISBN 0415086213. Odahl, Charles Matson. Constantine and the Christian Empire. New York: Routledge, 2004. ISBN 0415174856. Wilken, Robert L. Christians As the Romans Saw Them. New Haven, CT: Yale University Press, 2003. ISBN 0300098391. This page was last modified on 21 March 2017, at 18:53.